Event Management allows you to monitor events in your infrastructure, reporting on those you wish to focus on and establishing specific control and execution activities for corrective intervention. With events and corresponding survey and monitoring systems in place, the Event Management process guarantees your organisation more stability and efficiency in delivering its services, and allows you to carry out your business activities in the best possible way pre-empting disruption or interruptions which are managed proactively. 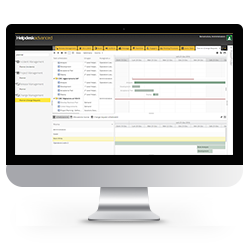 HelpdeskAdvanced supports you in managing events, providing specially designed processes for controlling and verifying situations that you decide to monitor for strategic purposes, as they are essential for the correct functioning of service, business and corporate dynamics. With HelpdeskAdvanced, you can effectively and efficiently manage strategic events, take proactive and automated action in response to specific events, in order to avoid interruptions and inefficiency in running the business. Identify strategic Events and anticipate disruptions. Constantly monitor events and their performance level. Improve quality of services and optimise operations. Guarantee continuity for your services and corporate operations.